So why hasn't Sony updated its smartwatch since then, especially when it was critically so well received? Will we ever see a Sony Smartwatch 4? We've put together everything we know down below, followed by some features we'd love to see if the company does make another smartwatch. Will there ever be a Smartwatch 4? Kaz Tajima, senior vice president of creative design and product planning at Sony Mobile, told TechRadar, "There’s still not a sufficient solution for the end user from a technological point of view. With the watch you have to charge it every day, which is unnatural for a watch. Those points haven't stopped other manufacturers from pushing ahead in the smartwatch space, but it's clear Sony is taking a long break from the tech until it deems the tech proficient enough to jump back into. There's clearly support for Sony's wearable devices too. 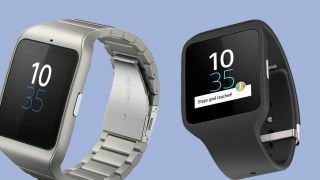 For example, in 2017 there was a petition from 4,000 Sony Smartwatch 3 fans that tried to encourage Sony to update the watch to Android Wear 2.0. The company ultimately didn't see fit to support it though. That's a shame for anyone who owns a Sony Smartwatch 3 or wanted a new device from the company, but right now the firm seems to be focusing on hearables like the Xperia Ear Duo or the concept device released the year before that. If we ever see the Sony Smartwatch 4, it may be a long time coming. Don't give up all hope of a new wearable from Sony, but there are currently no leaks or rumors so we would expect the quotes above from Tajima to still stand for how Sony feels about smartwatches. Originally we wrote a list of some features we'd like to have seen on the watch back in 2015 soon after reviewing the Smartwatch 4. Sure, owners with a little more cash could splurge on the stainless steel strap but that made have made the cost also shoot up. Other companies have achieved a design that works for sport and fashion such as the Apple Watch 3, so we'd like to see Sony do the same thing here. During our testing of the Smartwatch 3, we loved leaving our phones behind and taking advantage of its built-in GPS. But, on the flipside of this cool feature are a few serious downsides: the sensor's accuracy and its impact on the wearable's battery. We originally found that the distance tracked with GPS tended to differ quite a bit with what our phones would report, sometimes to the point that we didn't know which one to believe. Hopefully, the Smartwatch 4 would receive the hardware improvements necessary to ensure a more accurate tracking experience. Considering it's now four years later and GPS is better on a lot of smartwatches, we expect Sony could do this. Not every smartwatch has NFC or Google Pay support, but most top-end devices now have the tech inside and we'd love to see it come to a future Sony watch. It's a bit disappointment now when high-end smartwatches don't come with the tech built-in, so hopefully Sony will see fit to include the tech if it ever makes another smartwatch. The 420mAh battery packed inside the Smartwatch 3 is more juice than you'll find in a lot of other smartwatches. In addition to having a higher battery capacity than its competitors, it could also last longer than most of the competition at the time. It would run for up to two days, depending on how you used it. That said, battery life is getting much better on smartwatches now so we'd hope to see Sony improve that if it makes a next-gen device. The built-in GPS, gyroscope, and accelerometer on the Smartwatch 3 allowed for fairly in-depth tracking, but we'd love to see Sony push even more sensors inside the Smartwatch 4. Noticeably lacking was an optical heart rate sensor and altimeter, which can track your heart rate, and your altitude, respectively. This would give it the complete set of abilities we're looking for from today's smartwatches - let's hope Sony takes note. A Wear OS device with Wi-Fi capabilities is like a bird with unclipped wings that's still locked in a cage. Adding cellular access to the Smartwatch 4 will allow it to operate over a cellular signal while untethered from your smartphone. Plus, it might not be practical, or even necessary for some users, but we'll always take more features over fewer if it improves the smartwatch experience. Some might feel differently, but we think the Smartwatch 4 should hang onto the square design. Come on. It's rather charming, don't you think? OK... it's a little tough to defend the form factor, especially when many other gorgeous Wear OS watches come with circular displays but a square design would allow Sony's next watch to look unique.